Pinnacle Reserve is a North Scottsdale subdivision in the Pinnacle Peak area. Engle Builders built 1 and 2 story single family homes, with a square footage range of 3000-3400 square feet. Bocara, by Camelot Homes, is near Pinnacle Peak and Scottsdale Road. Bocara is a gated 50 lot residential subdivision, on approximately forty (40) acres. These single family one story homes are close to numerious golf courses, shopping, parks, and restaurants. Over 17 acres are dedicated as Natural Area Open Space (NAOS) in the Boraca subdivision, most of which is on the west/Scottsdale Road side. Santa Catalina Estates is a North Scottsdale subdivision in the Pinnacle Peak area with custom homes, 5,000+ square feet in size, on large private lots. Easy access to shops, dining, and entertainment only minutes away. Tierra Bella is a private gated enclave of 31 single family homes, built by Monterey Homes on large lots, surrounded by lush sonoran desert in North Scottsdale. The community is only minutes from popular shops, fine dining, and east access to the 101 freeway. Pinnacle Peak Estates 3 is a non-gated custom home development in the Pinnacle Peak area of North Scottsdale. Alta Sonora is a small North Scottsdale subdivision in the Pinnacle Peak area, adjacent to Happy Valley and Pima Roads. Pinnacle Paradise is a gated North Scottsdale custom home subdivision, with large lots, in the Pinnacle Peak area. The entrance is off of Pinnacle Peak Road, across from Pinnacle Peak Country Club. Pinnacle Peak Estates 1 is a non-gated custom home development in the Pinnacle Peak area of North Scottsdale. Desierto Vida is a gated North Scottsdale subdivision in the Pinnacle Peak area, built by Ebberts Homes in the late 1990s. Ladera at Los Portones is a gated North Scottsdale subdivision in the Pinnacle Peak area. Talara is a gated North Scottsdale subdivision in the Pinnacle Peak area. La Vista is a gated North Scottsdale subdivision in the Pinnacle Peak area. Built by DR Horton, in early 2000s. Vista Monterey is a North Scottsdale subdivision in the Pinnacle Peak area. Pinnacle Peak Villas is a gated North Scottsdale subdivision of 59 townhomes in the Pinnacle Peak area. There are a total of 59 homes built by Legendary Home between 1988 and 1993. Homes include single family and condos. Close enough to walk to dining, shopping, dry cleaners, and more. Los Portones is a gated North Scottsdale subdivision with 102 townhomes in the Pinnacle Peak area. The Los Portones townhomes include 72 single level and 30 two-story homes, built between 1987 and 1998. Many have undergone renovation/remodeling. Close enough to walk to dining, shopping, dry cleaners, and more. 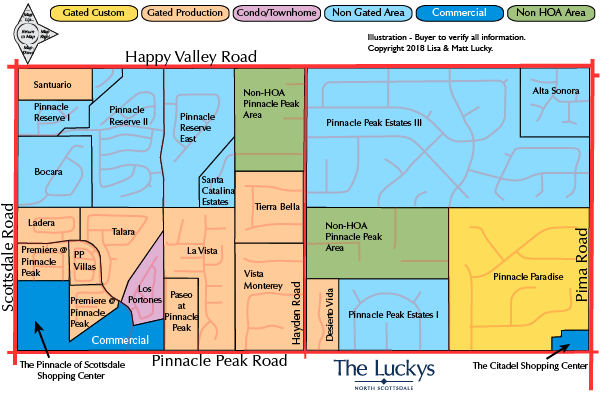 Happy Valley To Jomax map, in the Pinnacle Peak Area of North Scottsdale. North of this Pinnacle Peak Area map is the Desert Foothills Area map. This is a great location close to shopping, dining, hiking, parks, and the 101 Freeway. Shopping, dining, the General Store, and Russ Lyon Sotheby's International Realty can be found at Pinnacle Peak and Pima Roads. Watch this short video of the Canyon Heights Community, Scottsdale Arizona to better understand this area. Deer Valley to Pinnacle Peak map, in the Pinnacle Peak Area of North Scottsdale. This is a great location close to shopping, dining, hiking, parks, and the 101 Freeway. This is the Pinnacle Peak to Happy Valley Map, in the Pinnacle Peak Area of North Scottsdale. There are several smaller subdivisions in this Pinnacle Peak Area including townhomes and patio homes. There is retail and office space along Pinnacle Peak Road. This is a great location close to shopping, dining, hiking, parks, and the 101 Freeway. See all Pinnacle Peak to Happy Valley Road New. See all Pinnacle Peak to Happy Valley Road Sold.